Manchester United boss David Moyes has today been revealed to be suffering from gout. 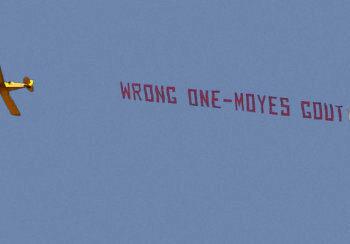 The revelation came via an unusual means: a banner, flown from the back of a plane, displaying Moyes' affliction. Several people, including Moyes' mum, are said to be "in a sort of shock". The message, written by what can only assumed to be a rogue doctor, also contained the mystery expression "Wrong One" - which most scientists have assumed refers to a previous incorrect diagnosis. Diagnosing gout at an early stage can be mighty tricky, according to one online doctor we interviewed. UPDATE: David Moyes has, in fact, now been sacked by Manchester United, and the true meaning of the banner can now be understood. The Glazer family, who own the football club, are said to be allergic to gout.